Here is some more information on area rug pads, the different types of rug pads there are and whether or not you should have one under your new rug! Right off the bat, the answer to the question of whether or not you need a rug pad, is YES. Below, we explain why. Rug pads are a great way to keep your rug in place, protect the flooring beneath your rug, and add an extra level of cushion to your rug that is felt when you walk on it. When it comes to keeping your rug in place, the benefits spread far and wide. If you have hard surface flooring such as wood floors, tile, laminate, etc., and your rug is not held down by a piece of furniture, it is likely that your new area rug will slip and slide all over the place. Whether it’s gradual or immediate, which depends on your rug and flooring, it is highly likely that you will find yourself constantly adjusting your rug, and putting it back in “its place.” For homes where hard surface is present, slipping/falling is an issue, an elderly human or animal (such as a dog) is present, or young kids are running around, we absolutely recommend a good rug pad. This will help prevent the likelihood of any injuries occurring due to a sliding area rug. We also recommend a rug pad for spaces with hard surface flooring, because the rug pad will help protect the flooring beneath it. For example, if you have hard wood flooring, without a rug pad, over time your rug could cause dyes or colors to transfer onto your flooring, or could wear down the stain of the floor after constant traffic and sliding. The rug pad will also act as a barrier, protecting your flooring from any spills or stains. Most notably, a rug pad will add extra cushion, making your area rug even more pleasant to walk on. 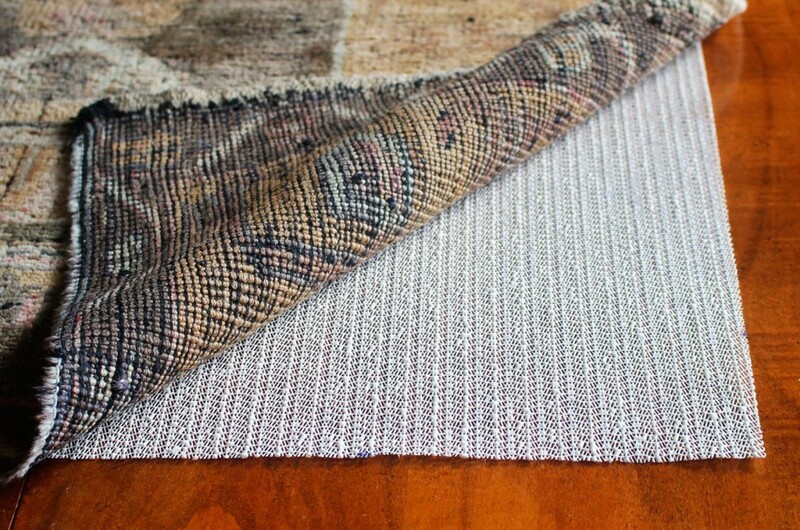 If, for example, you have wall-to-wall carpet beneath your rug, and aren’t sure why a rug pad would be necessary since there is no hard surface flooring to protect, it is important to note that in addition to keeping your rug from sliding on the carpet, the right rug pad will protect your carpet from any stains or spills. 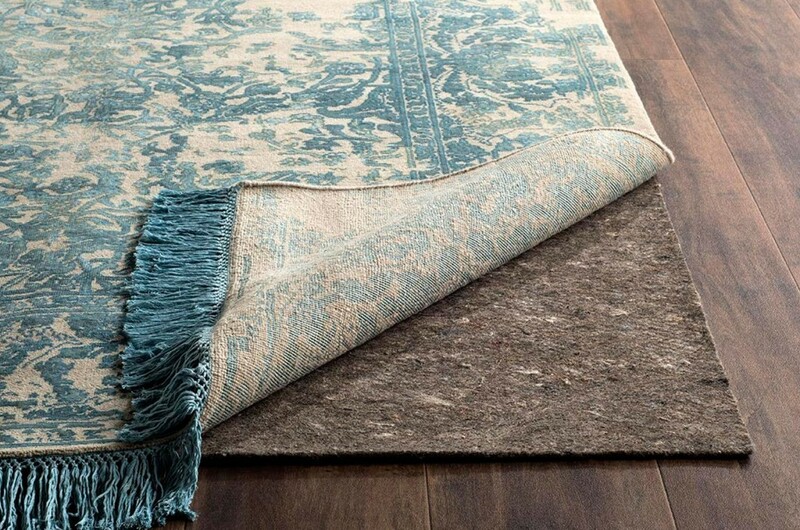 Should an accident of any sort occur on your rug, it will not seep through your rug into your wall-to-wall carpet. What Kind of Rug Pad Should You Get? With a variety of different rug pads on the market, how do you go about choosing the correct one? Well let’s start with the most common type which is the honeycomb or waffle type thin pad that is available most anywhere. These are by far the most affordable pad and are available at all major retailers. When it comes to weighing the pros and cons to this type of rug pad, there are a few of each. As far as pros go, the main one is definitely price, as this pad is by far the most affordable option. Another pro is the ease of cutting this rug pad to the correct size, and the fact that it is available everywhere. This area rug pad is good for use on ceramic tile floors, concrete and engineered wood. It is however not recommended for use on natural stone or real hardwood, as it can leave permanent marks over time, as the rug pad starts to break down. Next up is the thin rubber type area rug pad. This rug pad doesn’t offer much as far as cushion goes, but it does offer good skid protection, which means it does a pretty decent job at keeping your area rug from sliding. This pad is also very affordable and good for runners, smaller rugs and kitchen/bath mats. As stated with the prior pad, this type is good on ceramic tile and engineered wood, but not recommended for natural stone or real hardwood. Another very popular rug pad is the thicker felt type pad. This pad is on the pricier side but by far offers the most bang for your buck. This pad adds an excellent level of cushion to the rug, and helps protect the structural aspect of the rug. The underside of the pad is a rubber composite that does an excellent job of holding the rug in place. It is great for all types of flooring and is recommended for natural stone and hardwood floors. This pad is recommended for larger rugs size 6′ x 9′, 8′ x 10′, 9′ x 12′ etc. The life span of this pad is also great and absolutely outlasts the previous pads discussed. To purchase one of these best-selling rug pads, please click here. Additionally, for homes with pets, small children, or where spills and staining are an issue, we highly recommend a waterproof area rug pad. These rug pads are 100% Waterproof, which means they will prevent pet accidents, spills and stains from seeping into your floors. Additionally, they are odorless, ultra light, thin, durable and easy to install. Most importantly, they will not crumble, flatten or damage the flooring beneath your rug. These rug pads are great on hardwood and laminate (as well as all other flooring types) and can be purchased here.